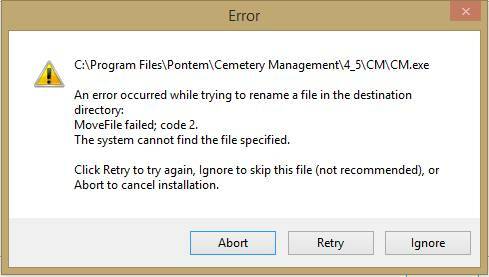 When installing Pontem's Cemetery Data Manager software, avast! 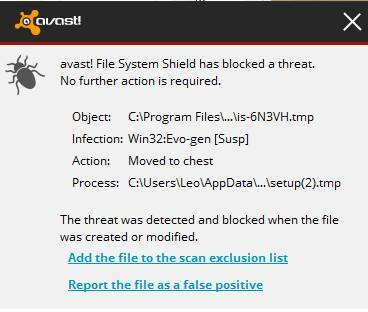 Antivirus 2014 is currently moving a required file from Pontem’s installer to avast!’s "Virus Chest." At this point, you will need to abort installation of your Pontem software. Unfortunately, attempting to restore the temporary file from the avast! Virus Chest and continuing the installer will not work. Click the 'Active Protection' sidebar item from the settings dialog. Click the gear on the 'File System Shield' in the active protection group to modify the settings. Click the 'Exclusions' sidebar item from the file system shield settings dialog. Click the 'Add' button at the bottom of the exclusions grid. *Type C:\Program Files\Pontem\Cemetery Management\4_5\CM into the path item of the exclusions grid, leaving the CM box checked. If your computer is a 64-bit machine, the path will be C:\Program Files(x86)\Pontem\Cemetery Management\4_5\CM. Click 'OK' to close the file system shield settings dialog. Click 'OK' to close the settings dialog. You should now be able to install Pontem Cemetery Manager without avast! removing files from the install process. Click on the Start button (lower-left corner of your monitor screen). In the ‘System’ section of ‘Properties,’ find the line titled System type. Whether you are using a 64-bit or 32-bit operating system will be indicated on the screen.